'Washington Post': White House Intruder Made It To Doorway Of Green Room : The Two-Way The Secret Service had originally said Omar Gonzalez was apprehended shortly after he burst through the front door after jumping a fence. 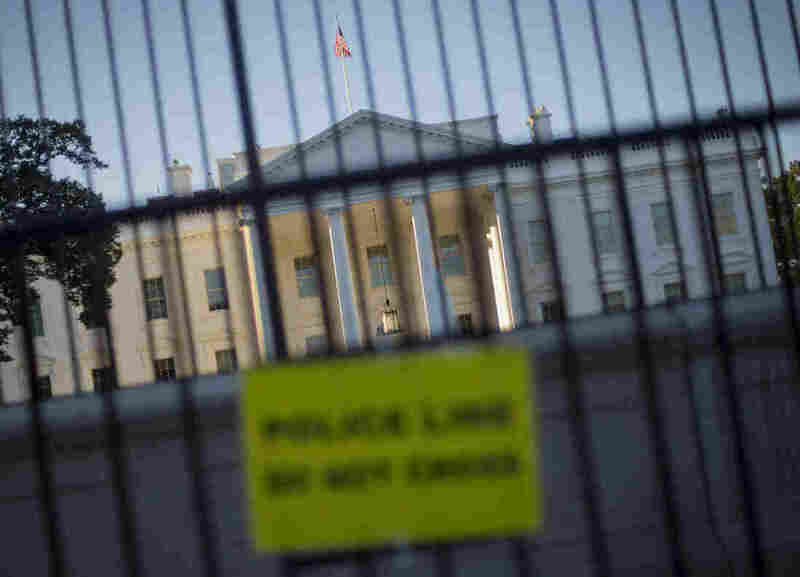 A perimeter fence has been placed in front of the White House fence on the North Lawn along Pennsylvania Avenue in Washington. The man who jumped the White House fence carrying a knife made it past the front doors, overpowered a guard, and then ran across the East Room before being tackled at the doorway to the Green Room, The Washington Post is reporting. Secret Service officials had originally said that Omar Gonzalez had been stopped shortly after he made into the White House. But this report has Gonzalez "running through much of the main floor." The Post cites "three people familiar with the incident" for its report. But the paper's Carol D. Leonnig has been dominating this story. Over the weekend, she reported that back in 2011, seven bullets hit the White House and Secret Service agents dismissed it as the backfire "from a nearby construction vehicle." "By the end of that Friday night, the agency had confirmed a shooting had occurred but wrongly insisted the gunfire was never aimed at the White House. Instead, Secret Service supervisors theorized, gang members in separate cars got in a gunfight near the White House's front lawn — an unlikely scenario in a relatively quiet, touristy part of the nation's capital. "It took the Secret Service four days to realize that shots had hit the White House residence, a discovery that came about only because a housekeeper noticed broken glass and a chunk of cement on the floor." Of course, the Secret Service has been embarrassed by a string of incidents lately. Chief among them was when six of its agents resigned over a prostitution scandal in Colombia. Back in March, the service's director, Mark Sullivan, retired after 30 years of service. All Things Considered talked to the Post's Leonnig this afternoon. It's worth noting that Secret Service Director Julia Pierson is scheduled to testify before a special House committee on Tuesday.